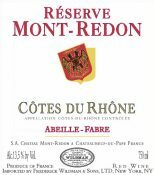 Terroir: Château Mont-Redon owns 25 hectares of vines in the Côtes du Rhône appellation. Around the towns of Orange and Roquemaure, their Côtes du Rhône vines are planted on stony, limestone-clay plains. The generous sun encourages the grapes to reveal all their best qualities on these terroirs. They also purchase premium wines from the top growers in the region to make wines under the label “Réserve Mont-Redon”. Vinification: Grapes are harvested by hand in mid September and transferred to the winery where they are sorted and destemmed. Maceration and fermentation occurs at cool temperatures in stainless steel tanks over a period of three weeks followed by ageing for 6-9 months in large vats. Deep color. Very expressive and complex nose with red fruits aromas. The mouth is rich with fines tannins and well-structured with cherry, plum and chocolate aromas. The finish is lightly spicy. "This provides a warm, fleshy core of cassis and cherry paste flavors, lined with light red licorice and singed vanilla notes. Drink now through 2019."